Meet Chet, the canine partner of the crime-smashing duo of Spencer Quinn's series Chet and Bernie. Dog On It (forgive the terrible pun) is the first of the series and is narrated entirely from the point of view of Chet, whose keen intelligence and olfactory sense is easily matched by his affinity for scarfing down old scraps and sniffing bottoms. 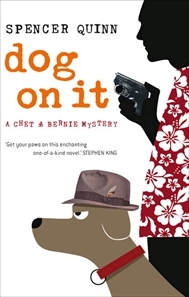 Bernie Little, the principle of the Little Detective Agency, is the human owner of crime-sniffing canine Chet and comes across as a most affable fellow thanks to Chet's interpretation. Like most other detectives you've ever heard of, he's 'hard bitten' and 'steely', but from Chet's point of view we get to also see his vulnerable side. As a character he's not as fleshed out as Chet, but we like him enormously anyway. The plot of Dog On It revolves around a missing teenage girl and the dirt Chet and Bernie discover when they're hired to find her. Her disappearance somehow seems to involve a Russian crime gang and a lot of money. During the course of their investigations, Chet manages to get into a number of scrapes coming this close to being put down at a dog pound. It's heart-thrilling stuff. And it's heartwarming too, as we get to see the foibles of human relations through his eyes and his utterly endearing loyalty to Bernie. Dog On It is a wonderfully funny book which I was so glad to discover is a series, because it's something I'd love to come back to again and again. Missing Mark, Julie Kramer - Quite a fun mystery caper about a TV investigative reporter on the trail of a missing groom who has vanished without a trace. Ides of March - A clever and provocative look at American politics - or rather the politics of politics in general. Ryan Gosling is as good as you expect as the young politico who loses his innocence/naiivety in the nasty game.